(PhysOrg.com) -- University of Notre Dame biologist Sunny Boyd's research is a little like "Match.com" for amphibians. Say you're a female tree frog looking for a mate--how do you choose among a number of potential suitors? Boyd, along with two postdoctoral researchers, two graduate students and three undergraduates, goes out into the real world—the real world being UNDERC, the University’s environmental research center in Land O’Lakes, Wis.—and observe what frogs are doing in nature. “Then we create computer models where we explore what might be causing the behavior,” says Boyd, an associate professor in Notre Dame’s Department of Biological Sciences. Female frogs prefer males with longer calls—a trait linked to better offspring. But how does she choose? The lab’s research is investigating two possible strategies. Does she pick the first male that meets the basic criteria, or—in what Boyd calls the “best of” strategy, make comparisons among several males? Frogs are useful organisms for conducting basic research, says Boyd, because they bear a considerable resemblance to humans—they have the same basic brain areas, and the same basic behaviors. 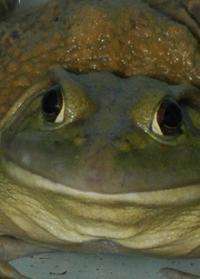 Another area of research looks at the vocal behavior of bullfrogs, something that’s often a critical component of social interaction. Many behaviors—including vocalization, aggression and reproduction—are influenced by neuropeptides and steroid hormones similar to those found in humans. An exciting new line of research involves African clawed frogs and a new technique called microarray. The lab is investigating a steroid hormone that’s produced directly in the brain, and trying to understand how it works. Boyd likens the technique to a glass slide, with probes for each of the 32,000 genes of the frog. A color development system allows researchers to see whether the treatment under investigation makes the genes more or less active—do they produce more or less of their chemical product? They’ve discovered—for the first time in any organism—that the steroid in question influences two other chemical messengers from the pituitary gland. It’s a potentially important discovery, Boyd says, since the neurochemicals in the brain of a frog are either identical or almost identical to those in the human brain. It’s a discovery made possible by advances in nanotechnology, she adds. In addition to ongoing research, the lab also performs another important role, Boyd adds—training students and post-doctoral researchers to do research, disseminate it to the world, and think critically. “They learn those things here, so they can work on other important problems” when they begin their own scientific careers, she explains. Ultimately, the mission of the lab is to advance human, animal and environmental health.